The Ognoas estate dates back to the end of the 11th century or the beginning of the 12th century. Ognoas belonged to the Viscounty of Marsan which in turn was part of the property of the Viscounty of Béarn until 1607. The origin of its name is up for debate as there are a number of different spellings cited throughout its recorded history: Onhoas, Ognouax and Oignoa. Some claim the name derives from the Gaul Onnos, who resided on its site. Some locals assert that it comes from the name of the highly perfumed onions that grow in abundance within its soils. Still others put forth that the name derives from the Latin Unio or Unionis, meaning agreement, accord or perhaps even state of matrimony. ​In 1770, Etienne Lormand purchased the Ognoas estate which was inherited by his son oldest son Nicolas, who also purchased the Manoir de Tampouy nearby. His younger brother Jacques-Taurin, an attorney and later politician, died in 1847 and, having outlived his brother but having no heirs, bequeathed 4 million francs in gold to a number of religious and philanthropic institutions. The estates of Ognoas and Tampouy were left to the little seminary in the diocese of Aire-sur-l’Adour. A portrait of Jacques-Taurin can be seen in the tasting cellar today. The painting is registered as a historical monument. The estate was overseen by the Bishop of Aire-sur-l’Adour until the Law of 1905 that separated Church from State when the property was transferred from the Diocese to the Département. The 650 hectare estate came under the responsibility of the Landes General Council which chose to make this exceptional site a showcase for the Landes area. The main buildings on the estate have been completely renovated and are open to the public. Today, the Domaine d’Ognoas is an agricultural holding combining almost 50 hectares of viticulture and more than 100 hectares of agriculture (corn, soya and sunflowers). The estate also boasts a forest covering some 300 hectares that provides the wood used to make their Armagnac barrels. The main building was built on a natural plateau overlooking the Midou River to the west. Towards the end of the 1400s, the fortified house was transformed into a more comfortable residence that included a spiral staircase tower and its lavishly decorated doorway. The building now houses the reception, boutique and the tasting cellar at Ognoas. The gem of the estate is their 1804 still, designated a historic monument in 2004 and still in use today. Records of brandy production at Ognoas date as far back as the 1780s. 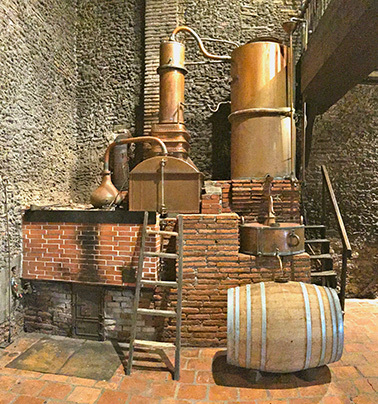 The Ognoas still is one of those designed in Armagnac in the early years of the 19th century calling on the technique of continuous distillation. It is fitted with plates containing spider’s legs, an improvement ascribed to the Sier family of still makers. It has never been out of service since it was first built, making it the oldest working still in Gascony. Ognoas supplements its production with an old traveling still from 1936 which has been fixed to the ground since 1999. 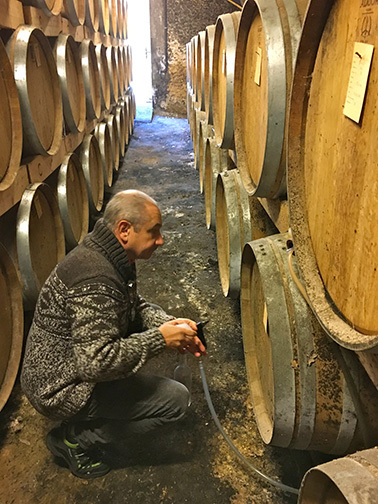 Together with the 1804 still, it is used to distill the 500 hectoliters of armagnac between the beginning of November and the beginning of December. Ognoas has a number of storage chais on their grounds. One lies a couple miles away and another next to the main house where the youngest spirits rest in new oak for several years. The staves are air dried on the property and fabricated by Gilles Bartolomo at his nearby cooperage. The wood, from the time the tree is felled until armagnac is housed within it, travels a total of 5 kilometers! Once the spirits hit their teenage years, they are transferred to one of two other chais where they age peacefully in older oak. These storage areas are well ventilated and experience the vagrancies of temperature depending upon the season of the year.